More and more people today work in open offices or coworking spaces. Such environments present unique challenges and opportunities, and the following tips can help ensure personal privacy and also maximize productivity. The coworking and open-workspace revolutions are upon us. Many modern offices have already switched to open-plan concepts, and dedicated coworking spaces continue to become more and more popular. The general idea is to move office workers from their fixed cubicles to more open environments, to encourage interaction and collaboration. And coworking spaces let employees work from their locations of choice. Today, the sight of workers moving around throughout the day with their laptops is common, and they often huddle with different groups. But how can employees remain both productive and secure in such environments? Here are some basics for anyone who's new to an open office or cowork space. After you get comfortable in a new workspace, you might be tempted to leave your laptop unattended. However, you should always lock your computer, even if you step away for just a few moments. You can simply configure your laptop to lock when you shut it, and then make yourself get in the habit of closing the machine whenever you leave. If you use a Windows PC, the Windows + L shortcut also immediately locks your computer. And if you're a Mac user, you can use a "hot corner" to auto-lock your computer. What about that guy next to you and his annoying habit of constantly glancing at your screen? An easy way to resolve this without constantly blocking or locking the screen is to ensure there is nothing to look at on your display when you're not using it. Windows 10's virtual desktop support means you can use a shortcut (Windows + Ctrl + Left arrow or Right arrow) to switch to a desktop with no running apps. Or you could buy a privacy screen. Some coworking environments use open Wi-Fi networks, which can be security risks, because they expose the sites you visit to people with wireless sniffing software. Some URL requests are transmitted in plain text, even on SSL-enabled websites, and the issue is made worse when improperly coded websites piggyback sensitive data in URLs. Even at coworking locations that use encrypted Wi-Fi, network access policies may let administrators monitor or log all network traffic. Such policies can breach corporate IT regulations, so you should check in on the Wi-Fi rules before catching up on work at a coworking location. The simplest solution: a VPN service that encrypts all of your traffic. The average IT department can easily set up a VPN. People who work alone or at a startup may want to opt for a commercial VPN service instead. Thankfully, scores of companies offer speedy and highly affordable VPN services, including VyprVPN and NordVPN. You can scan and upload multi-page documents to the cloud with a smartphone using CamScanner Premium. One advantage of today's open or coworking environments is the capability to work at different locations within an office. However, the option is less attractive if you have to lug around stacks of paper printouts whenever you move. And that makes a digital workflow essential. Hardware scanners can help you digitize print materials, but smartphone apps such as CamScanner are often more convenient. Optical character recognition (OCR) software, including ABBYY FineReader, can make it simple to convert scanned documents into text, while PDF software such as Nitro Pro 11 can manage PDF workflows and convert PDF files to Word, Excel and PowerPoint formats. Modern collaboration tools can also be extremely useful in coworking environments. For example, digital notetaking apps such as Evernote and OneNote can help you keep and maintain digital notes. Accidents are more likely to happen when you frequently move around or switch places with your laptop in tow. 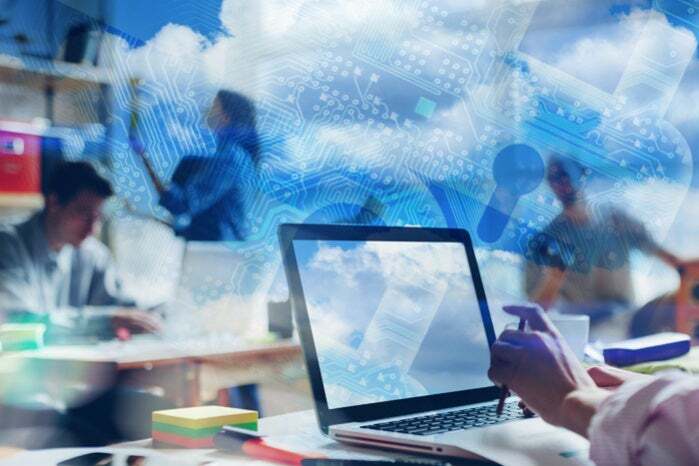 For minimal work disruption and to prevent data loss, you should ensure the latest files are always available by synchronizing with a cloud storage service. It's also a good idea to avoid storing files on your desktop, because it is not usually synchronized — unless you create an appropriate sync rule to cover it. Be sure to keep important data such as browser bookmarks and encrypted password files in sync, too. Fewer walls and cubicles can mean a more distractions and random conversations. Personal time tracking can play a crucial role in maintaining productivity. Many functional time trackers exist today, though Toggl is one of the most intuitive and easiest to use. Another option, the RescueTime app, runs in the background and tracks time spent on applications and websites, and it puts together detailed reports on how much time you spend replying to emails or browsing social media websites, among other things. RescueTime can help determine if you spending too much time on Facebook. Working in an open office or at a coworking space takes some getting used to. However, the concept can be rewarding for workers who like to collaborate, enjoy the freedom to move around and appreciate more dynamic environments. If you fall into one of these groups, the above tips should help you work more efficiently and securely.